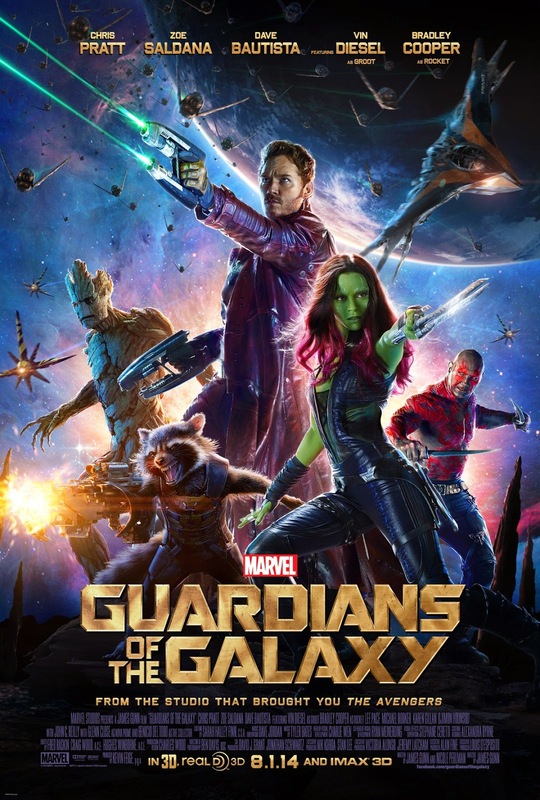 The first thing you should know, or will know after having seen Guardians of the Galaxy is that despite being a Marvel film in the same comic book universe as The Avengers films that have come before it, this film is not a hero film. It's a film about non-heroes. The main characters are criminals. They're thieves, smugglers, assassins and maniacs. The film itself departs wildly from the rest of The Avenger films because it takes place mostly in space, and while the others have had humorous moments, none have been outright comedies. Guardians of the Galaxy is a comedy. It's Marvel's self parody film. In many ways it felt like watching a George Lucas inspired Star Wars parody/spinoff, right down to the parallel lines of action during some of the bigger action sequences. There is even a Lucasfilm related cameo at one point. It doesn't have the benefit The Avengers film had in that we had already seen individual films devoted to most of the heroes. We already cared about those characters so the film was free to establish the threat (a villain we also already knew) all while having fun with them all interacting together until they became a cohesive unit. This film, however, has to introduce each character and make us care about them on top of everything else. For the most part it succeeds in doing so, at least as far as the main characters are concerned. Nebula is much more interesting than Ronan. The villain however is not well established. He is supposed to be dark and menacing, but instead he's bland and lacking personality. His name is Ronan (Lee Pace), he's big, blue and speaks in a deep voice. He supposedly works for Thanos, but that's about all I can really say about him, and that's about all the film offers. 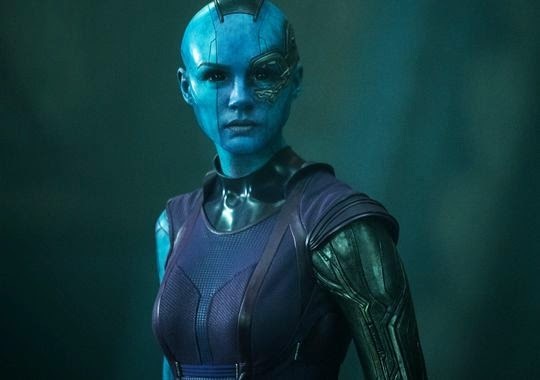 The henchman Nebula (Karen Gillan) and semi-bad guy Yondu (Michael Rooker) are both far more interesting characters, and yet both are fairly minor characters in the grand scheme of this film. Also in true Marvel fashion, the villain's plan involves the use of some unknown, non-understandable, space magicy power source that essentially does whatever they want it to. As usual the sense here is that all they need to tell us is that it would give the villain unlimited power (whatever that really means), and since they're evil, we don't want that so he must be stopped. And while that's probably enough for most people, it's just not that interesting, especially after the first several times it's already been done. I know my memory of Thor: The Dark World is a bit foggy, but I honestly couldn't tell you the difference between the Aether and the object of power in this film. Better established, thankfully, are our cast of non-heroes, who become fugitives on top of their likely impressive rap sheets. The only reason they work together in the first place is because of a shared interest in wealth and vengeance against the bad guy... but mostly just wealth. The orb Star-lord stole (in the aforementioned opening sequence) is actually worth a lot of money for reasons that become clear later on. In true marvel fashion, the fun is watching this dysfunctional group come together to save the universe even if only for the selfish reason that they also have to live there. Zoe Saldana, who seems to be trying to cover the rainbow having played a blue skinned character in Avatar, now plays a green character named Gamora. Dave Bautista humorously plays Drax, the muscle bound maniac, who is a very literal thinker just learning the concept of metaphors and figures of speech. Rocket, voiced by Bradly Cooper, is a tough, no nonsense raccoon who's small size is made up for by the extra large weapons he carries around. 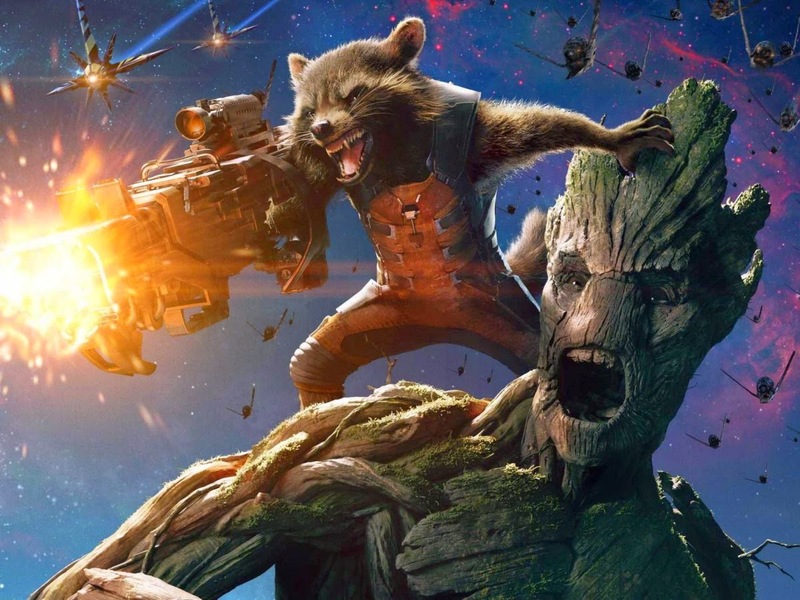 His partner in crime is Groot, voiced by Vin Diesel, a tree-like creature who is easily the film's most lovable character despite his lacking vocabulary. And finally, the main character of this ensemble (if you had to try to pick a main character) is Peter Quill (Chris Pratt), a more immature version of Han Solo, who prefers to go by the nickname Star-lord, if he can get anyone to remember it. Peter is the most well established of the bunch. From the opening scene we get a sense of his arrested development. After his mother dies, he's abducted by aliens, and raised by pirates and smugglers. These space adventurers, as you can imagine, can't have made for proper parent figures. In this context we can understand why he is immature and essentially frozen in the 80's in as far his only concept of good or popular music is oldies. The only music he has was given to him when he was a kid on mixtapes from his mother. The group doesn't have the interesting variety in skill sets that The Avengers do, yet they are interesting to watch nonetheless. In fact these non-heroes, as witnessed in an early scene in which they (minus Drax) meet for the first time, fight and stumble over each other, each trying to stop or capture the other for various reasons. It's a showing less of what they are capable of, and more of just how inept they can be. And yet the miracle, by the end of the film, is witnessing what they are capable of when they work together. Another reason I call this parody is because of its extreme sense of self awareness. It knows it's a movie with a McGuffin, and acknowledges it by making one of several references to pop culture, the idea of which is normally reserved for parody films. It calls attention to it, such as when Peter tries to tell stories to Gamora that are actually just old movies. He introduces her to the idea of music, rythm and dancing. It's fascinating and humorous to think about, this idea of meeting an alien species with no knowledge of human pop culture, and the temptation to pass off old movies as our stories. However, once we get passed all the jokes and start thinking about the story itself, we realize it's not really that strong, or very original. I can't help feeling as though we are continually seeing the same ending or slight variations on the same scene for the final act of just about every Marvel film. This one feels different in that it takes place mostly in space, but they all seem to involve lots of things flying around the sky and something large crashing down to the ground perhaps causing large amounts of destruction. We need something real to happen, something to remind us the serious nature of the danger involved. Which leads me to the problem throughout the film that pretty much every slightly serious scene in the film is undercut by jokey, comedic moments. As funny and entertaining as they may be, at some point you just stop taking these "serious" moments seriously, knowing that it'll all be broken up by a joke of some sort. Also, as with any film who's title comes from the name or title of the main character(s) there seem to be the temptation for screenwriters to have the character say it during one of their big "blockbuster moments." It's become so corny and cliche that it's now a pet peeve of mine. I recently complained about a similar moment in Divergent. Sadly they fell for the same trope here as well, and despite the fact that this is a much better film than Divergent, I still found it no less annoying. It pulled me out of what was otherwise a very nice moment. I don't mean to make it sound all bad though. There are a lot of laughs throughout, and some highly entertaining action sequences. The special effects are also excellent. Reception has been mostly positive for the film. Right now it has a 92% positive rating on Rotten Tomatoes, and is being called the must see summer blockbuster this year, and rightly so. It's by no means a perfect film (not there really ever is). The film is funny and entertaining. It's filled with a lot of moments that work and some that don't. The strengths of the film are the clever witty writing, strong performances and chemistry shared among the main stars. It's neither the best nor the worst film in Marvel's ever expanding library. It is, however, one of the most fun cinema going experiences I've had all year.